This month our special guest is legendary live announcer Randy Thomas (The Oscars, The Super Bowl, The Emmy Awards, The Tony Awards, Entertainment Tonight, ABC’s Nightline, and more)! She joins V.O. Pros Tish Hicks and home studio expert Dan Lenard (our “tech‑know” sensei), with answers to questions on live announcing and promos, tech and technique, career mindset and more. This month our special guest was legendary live announcer Randy Thomas (The Oscars, The Super Bowl, The Emmy Awards, The Tony Awards, Entertainment Tonight, ABC’s Nightline, and more). She joined V.O. Pros Tish Hicks and home studio expert Dan Lenard (our “tech‑know” sensei), with answers to questions on live announcing and promos, tech and technique, career mindset and more. CLICK HERE TO GET THE REPLAY! Thinking about voiceover? Looking to re‑energize? 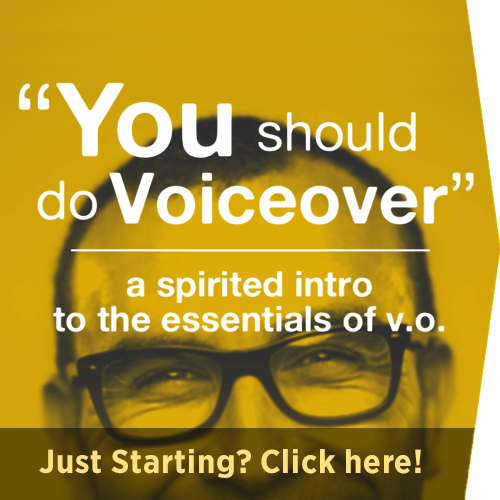 Join us for our next “You Should Do Voiceover” Live Weekend Intensive in L.A., Mar. 16th‑17th. Find out more or go ahead and REGISTER NOW! Dojo blackbelt Jason Vande Brake went from “You Should Do Voiceover” to getting repped by William Morris Endeavor and booking in just a year.